The Long Island Sound is among the northeast region’s most important and valuable estuaries. Commission staff members who work at the Long Island Sound Study are helping to implement a management plan for the estuary that includes research, monitoring, and public education and outreach. An estuary is a semi-enclosed body of water where freshwater from rivers and streams mixes with salt water from the ocean. The Long Island Sound estuary is 1,300 square miles in size with over 600 miles of coastline. The Sound watershed, or drainage basin, covers more than 16,000 square miles. It extends beyond New York and Connecticut to parts of Rhode Island, Massachusetts, New Hampshire, Vermont, and Quebec. More than 4 million people live within the coastal boundary of the Sound. More than 9 million live within the greater watershed. Long Island Sound provides crucial habitat for a diverse range of plant and animal life. The Sound is home to more than 1,200 species of invertebrates, 170 species of fish, and dozens of species of migratory birds. The Sound also supports diverse usage through commercial and recreational fisheries, transportation and commerce, and boating, bathing, hiking, and bird watching. These activities generate billions of dollars annually in the regional economy. 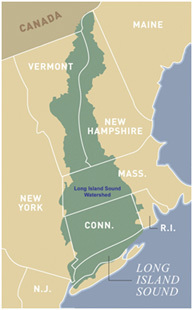 In 1987, Congress designated the Long Island Sound as an estuary of national significance. The Long Island Sound Study (LISS) is one of 28 National Estuary Programs funded by EPA under Section 320 of the Clean Water Act. Protecting and restoring the water quality of the Sound is an important goal for NEIWPCC. The LISS Management Committee is a partnership of stakeholders representing citizen and environmental groups, businesses and industries, academic institutions, and local, state, and federal governments working to implement the 2015 Comprehensive Conservation and Management Plan. The Sound Health is a report to the public on the environmental issues affecting Long Island Sound that is developed on a biennial basis. It provides information on water quality, the abundance of animal and plant life in the Sound, efforts to restore natural areas, and efforts to increase public access to the waterfront. Each report also highlights special projects or topics. To view the Sound Health reports electronically, please visit the Long Island Sound Study’s Sound Health webpage. In 2006, Congress created the Long Island Sound Stewardship Initiative in order to recognize and protect areas around the Sound that hold ecological and recreational value. A bi-state work group selected 33 inaugural areas, termed stewardship areas, from around the Sound. The areas are highlighted in an online Stewardship Atlas on the Long Island Sound Study website. The Atlas tells why the site was selected as a stewardship area, shows photos and videos highlighting the ecological and recreational importance of the site, and provides additional information helpful for planning a visit to the site and surrounding area. Interested in working with the program? See our Contractor Opportunities page for open requests for proposals. In addition, NEIWPCC staff are also engaged in the ongoing effort to revise the Total Maximum Daily Load for nitrogen in the Sound. For more information about NEIWPCC’s involvement with LISS, contact Richard Friesner, Ph.D., at rfriesner@neiwpcc.org.